Mostly used for gear levers but many other uses from pedals to joysticks. Made from soft, Satin Black leather approximately 1.5mm thick. Double sewn seams and split at the top with a lace tie. Ten, punched, 3mm holes around the edge. Trimmed with curved circumference for our oval chrome Gear Surround Frame, #GS1, or make your own. Circumference around open end 370mm. 480mm circumference around the base opening. 330mm long. Handle length 100mm leather gaiter length 300mm. Circumference of open end 500mm. 50mm diameter without a neck. 16mm hole size. For fitting to shafts between 10mm and 16mm diameter. Supplied with selection of reducing sleeves for universal fitting on levers up to 14mm diameter and grub screws with hex key. 48 dia. x 70mm. Supplied with selection of reducing sleeves for universal fitting on levers up to 14mm diameter and grub screws with hex key. 85mm x 38mm Dia. Can be cut to any of 6 sizes from 70 x 60mm to 140 x 95mm. Chrome Trim 107mm x 125mm. Very nice. 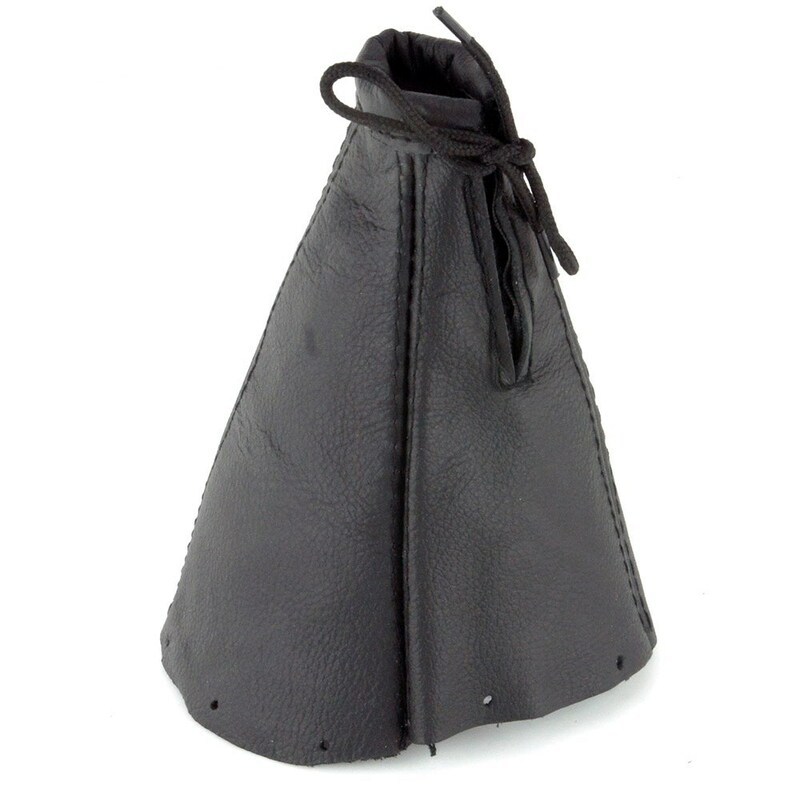 Black leather gaiter. Height 150mm. Die-cast chrome trim 107mm x 165mm x 8mm high. Die-cast, round top, oval, chrome frame 105mm x 145mm x 10mm high. Chrome frame 205mm x 105mm. Chrome frame section 12mm wide x 8mm high. Die-cast Chrome surround- maximum dimensions 170mm x 150mm. Frame thickness 10.5mm. Elasticated bottom 385mm (15") fully stretched, 220mm (¾") relaxed.